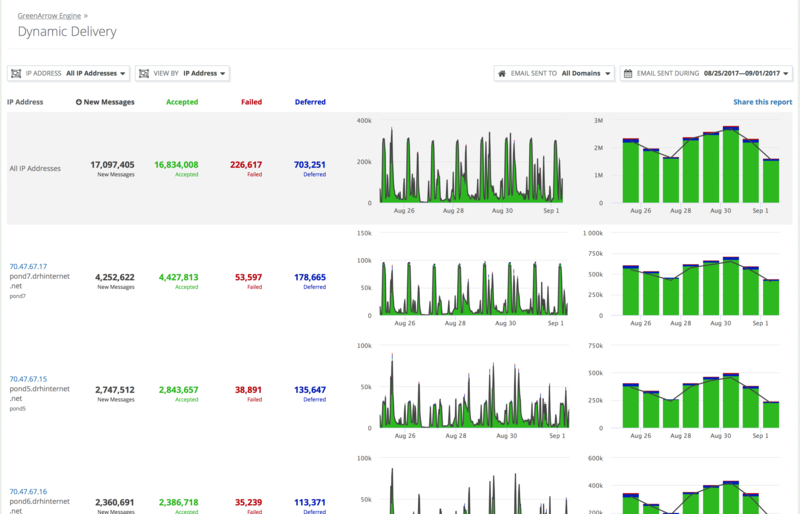 The Dynamic Delivery statistics page provides insight into recent delivery activity in GreenArrow Engine. You may use it to view the performance of IP addresses, throttling rules, or results for specific domain names. 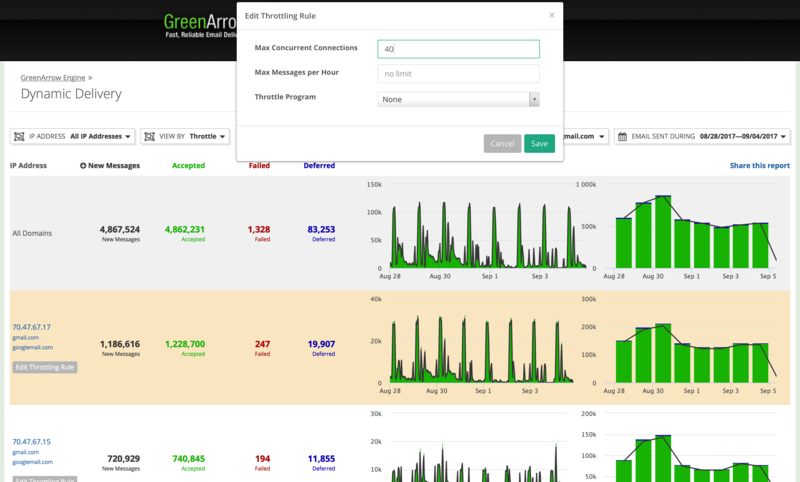 This page can be accessed by logging into your GreenArrow Engine installation’s web interface, and clicking on the “Dynamic Delivery” link that appears when you mouse over the “Statistics” tab. Filtering and organizing the report is done with the controls on the top line of the page. Use the “IP ADDRESS” filter to reduce the data to a single IP address. If you’d like to reset to viewing all IP addresses, click the filter again and select “All IP Addresses”. This shows a single row for each IP address, providing a summary of the delivery performance of each IP. When filtering to an IP address: This shows a single row for each “monitored domain” in the IP address. When showing all IP addresses: Each row shows stats for a domain name across all IPs. When showing all IP addresses: Shows the above rows for all IP address combined together in a single report. This allows sorting to find problem throttling rules on any IP. Click the “EMAIL SENT TO” filter to reduce the data to one or more recipient domain names, or to expand it back to all domains. The following values are displayed for each row of the report. The number of messages that had their first delivery attempt scheduled on this IP address. This includes delivery attempts that were cancelled due to throttle limits (status=connmaxout). The number of messages that were successfully delivered through SMTP. The number of permenant delivery failures that occured after connecting to the SMTP server. The number of temporary delivery failures that occured after connecting to the SMTP server. Temporary errors from SMTP servers that are “upgraded” to permanent errors because the maximum retry time for the message has elapsed (status=failure_toolong) are counted as deferrals in this reporting, because the SMTP server returned a temporary error. Each row in the report shows a graph of a time-history of each of these data points. The Y-axis of this chart is messages/delivery-attempts per hour. The Accepted, Failed, and Deferred stats are represented as a stacked bar chart, so that the top of the bar-chart colored area represents the rate of delivery attempts per hour. The smallest slice of time that data is recorded for is 5 minutes. Graphs of larger amounts of total elapsed time may aggregate these 5 minute slices into larger time slices to display on the graph. Date ranges of greater than one day will also include a daily summary graph. In the summary graph the Y-axis is the total number of messages/delivery-attempts per day. Click on the numeric value for one or more of the four columns to toggle its display in the charts. This can be useful to better visualize deferrals and failures. To view the delivery rates for a particular slice in the time series, click on the chart. After clicking, a hovering box will appear showing this data. At the top is shown the time range that the hovered slice encompasses. The numbers shown are the rates “per hour” over the course of that time slice. For example if 10 messages were injected over the course of a 5 minute time slice, that slice has a rate of 120 New Messages per hour. When viewing a report organized by IP address, clicking on an individual row will take you to the list of domain names delivered to by that IP. When viewing a report organized by domain name, clicking on an individual row will take you to the report for that domain name across all IP addresses. When viewing a report organized by throttling rules, clicking on an individual row will take you to that throttling rule’s definition. Additionally, there is a button “Edit Throttling Rule” next to the throttling rule. Clicking this will open a modal dialog to edit the throttling rule’s values. Click on “Share this report” to receive a URL that can be shared. The shared link will contain the precise date range used in the current report. Viewing the shared URL will require authorization to access GreenArrow Engine. Bookmarking the URL of this page will preserve the date range selection (for example “last day”) instead of the actual date range. Click on any of the headers “New Messages”, “Accepted”, “Failed”, or “Deferred” to sort by that column. These reports may not perform well on systems that have more than 1,000 IP addresses or report filtering/organiation selections that include more than 1,000 rows. Using these reports in these cases may result in either slow responses or error messages.